I would like to believe that I have never been one to follow eating trends or the like. But, it just isn’t the whole truth. I have dibbled, dabbled, scribbled and scrabbled. Food and cooking has always been my drug of choice. It has always heightened whatever state I have been in. Pulled me up and tugged me down. And it’s been easy to blame food. It has no defense. Having certainly reached the heights of various extremes, oscillating the vicissitudes of the food paradigm, I eventually learned that my own level of consciousness impacts it all. I eventually came to the realization that my relationship with food, was only a mirror of my internal dialogue, conflict and even ignorance. Freedom, at last! There may not be a one-diet solution to our food woes. Besides, there’s enough going on in the world of food, eating and cooking that not everyone needs another person, another expert telling them what to eat, no matter how passively suggestive it may come off. Yet, there are, of course, a few concepts worth digesting. Balance. Moderation. Awareness. Gratefully, loose ideas that can be applied to any particular diet. When I came across this chart of food vibration. I thought ok, yes, it makes a whole lot of sense. I may even be as accurate as a pendulum. 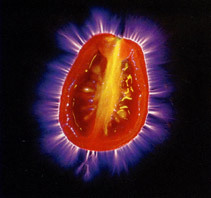 Then I reflect that once upon a time when I was in love with David Wolfe’s book, Eating for Beauty, which contains amazing and undeniably stimulating kirlian (electrophotography) images of living foods. And to this I said yes, ok. There’s truth in it. I dibbled and I dabbled. Most recently, amidst the routine of daily cooking for family and business, I spontaneously decided to fast/cleanse. Not because a new method or trend has been introduced. Not because I am feeling sick or need to lose weight. My whole BEING made the request and I obliged. And this time it happened differently than any other. I just began to repel certain foods and had a craving for nothing in particular. So, I listened to my body and said why not? Intuitive? Yes! There is something magical almost, about the unknown. And once we surrender to it, dissolve the fear associated with it, we can let go much more swiftly. If nothing else, I learned to trust that an intelligence far greater than my own knows what will come of it. I certainly feel lighter, clearer and more energized because of it. The rest, is…well, still unknown and that’s the beauty in it all. Still, I scribbled and I scrabbled. When we are participating in the flow as conduit in the great chain of Being, of which food is a part of, we open ourselves to the idea that food (like the body) has an intelligence, a pattern, a history, a universal context, and has been touched by energies of the elements. Solar, Lunar and planetary influences all make up the existence of plants, minerals and animal kingdoms. Add our own energy to this cosmic soup and there’s wholeness. 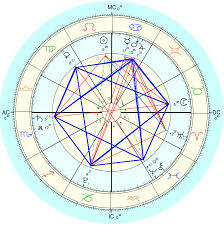 It’s easy to process when it applies to astrology, our birth charts and even horoscopes. But how often do we think about how the planets affect the foods that we choose to eat? It only took me 30 years to figure it out. So here you have a Grand Sextile Salad. My hope is that you are wondering what is Grand Sextile is, if you don’t know already. Followed by… and why should I care? Or what does this have to do with how I cook or what I eat…What’s the big deal, you say? In July we had a major planetary event, where six planets aligned to form what some of us refer to as the star of David, the six pointed star, the balance of male and female energy. In geometric terms, a tetrahedron. In metaphysics, the mer-ka-ba, a vehicle of light, which surrounds our field…Every other planet-three of which are earth signs and three water signs come together to reflect a rather feminine quality. It happened again on August 25th. To some it symbolizes an open gate or portal of possibilities. on our food, whether we are conscious of it or not. My only hope is that this interests you enough to stick around and read further. Along with conscious eating and cooking, there is another aspect to this wonderful dynamic with food, worth thinking about. Cosmic consciousness. Within this realization, relationship is the most important aspect of living. It allows us to see the connection between all things, the people we meet, the plants we eat and the planet we live on and even… the planets we don’t inhabit or know too much about. We are influenced by all of these beautiful connections, contractions and extensions of ourselves. In understanding that transformation or transmutation is a process, and that each edible plant, flower, herb and food naturally has alchemical properties, alchemists, put together a guide that speaks to this wisdom. Mind you, this information is not as new age as it seems. It’s ancient, has passed down and finally resurfaced. In basic terms each identified food as a corresponding planet, like us. And each planet comes with their own archetype and therapeutic purpose. In this case, the goal of the alchemist is to master the life force and release the inner spirit of a plant, to get to the essence of it. Alchemist or not, when we eat plant foods we are accessing this very same energy on various levels- spirit, mind and body, as ONE. So what we have is a salad that is made up of as many of the planets involved in the past planetary alignment as possible. 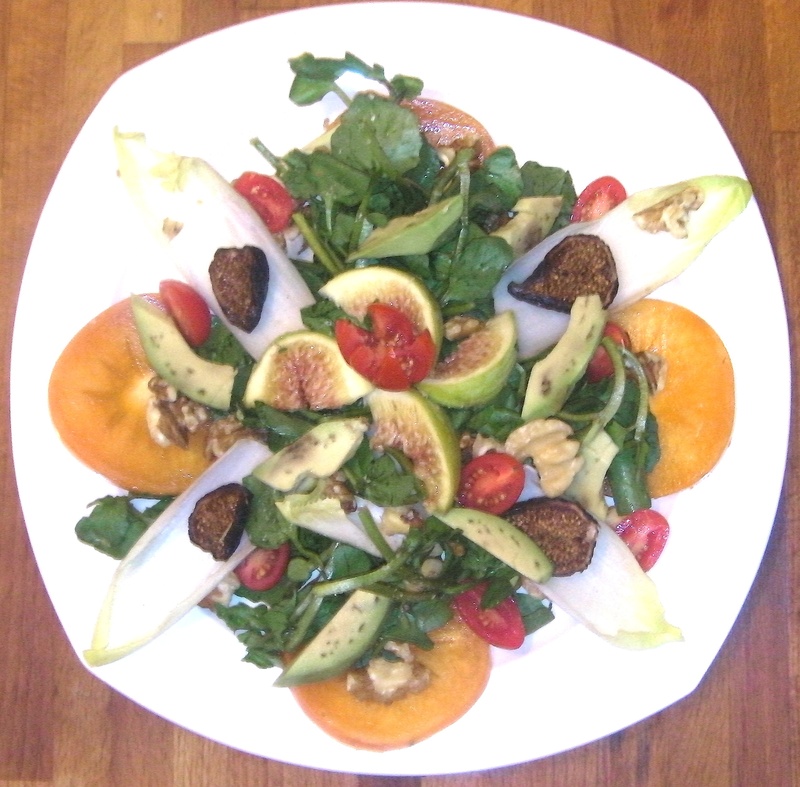 For instance, persimmon is ruled by Saturn, avocado-Venus, watercress-Moon, walnuts-Sun, tomatoes-Venus, figs-Jupiter, endive-Jupiter. This makes up my Grand Sextile Salad. Beyond nutrition, the quality of each planet, is reflected in each ingredient. The window of possibility is limitless, as is what we do with food, as is… our cosmic consciousness. 5 Weekday Plant-Powered Dressings that will change your Summer Salad Game.